Today am not in a mood to write. I hate to be sick, but on rare occasions your body gives up yelling for some rest. Same has happened to my body which wants to relax, for couple of days, to rejuvenate itself before setting on to the daily grind again. This papad curry is one of my favourite vegetable curries. The recipe is quite flexible. You may prepare the gravy my way or in any different way as deems fit to you. 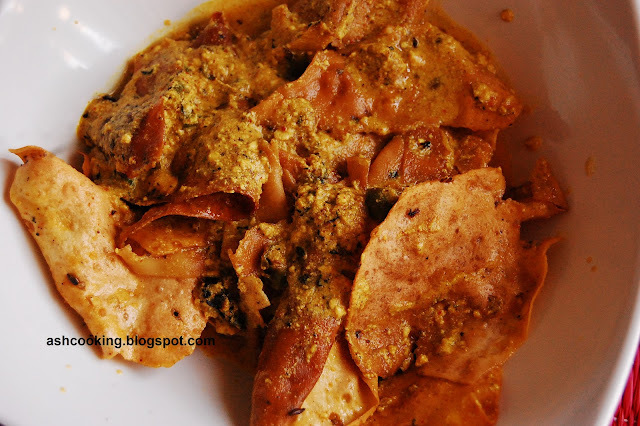 My hubby, for instance, was telling me that during his school days in Purulia Ram Krishna Mission, papad curry made with papads dropped in plain masoor dal was frequently served in the hostels and they all used to slurp it with relish. 1) Heat oil in a wok and fry the papads. Take them off the flame and keep aside. 2) Into the same oil add cumin seeds and wait till they begin to crackle. Add chopped ginger and green chilles. Stir around. 3) Add 2 tsp of ginger-garlic paste, coriander powder, red chilli powder and turmeric powder. Sauté. 4) When spices blend into a nice flavour, add curd and 1 cup of water. Bring the gravy to a boil. 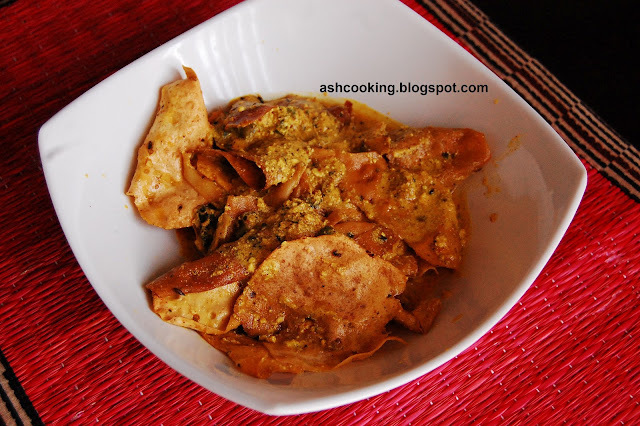 5) Add the fried papads now. Season with salt. Be gentle with the amount of salt as the papads are already salted. 6) Finally garnish with coriander leaves.